KwikSafety is a pioneer in safety technology. We engineer all of our products to provide the greatest quality at a great value. 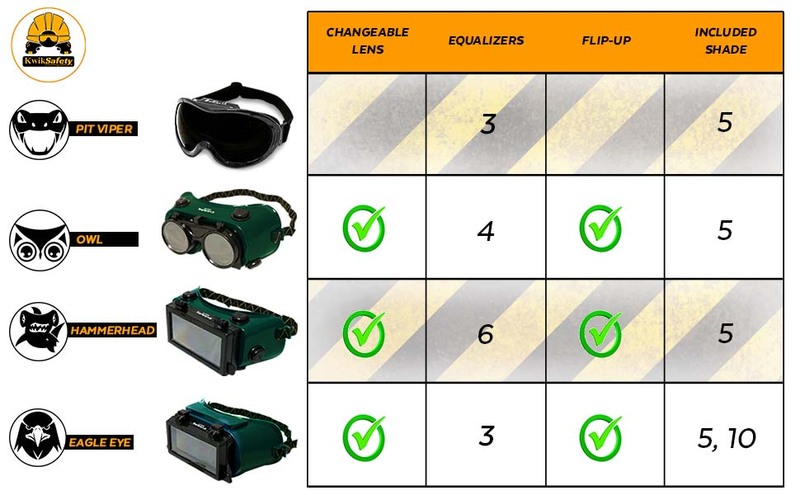 We offer welding goggles in 4 different styles to best accommodate all our customers and their needs. Our Green Series are made out of green PVC material an elastic headband and a snug fit lip that conforms comfortably to the head and allows ample room to fit over regular eye glasses. The vents act as pressure equalizers to provide maximum air flow and prevent any fogging of the goggles while working. The shade #5 lens are flip up and are easily changeable to the proper shade lens for different welding and cutting working methods. Our Shade #5 lens can stand up to a welding current of 1 amp and are best used for Plasma Jet Welding, Welding and Brazing Flame cutting and perfect for Oxy-Acetylene Cutting, Welding, and Brazing Projects. Our Black Series Jet Skull Scratch Resistant Welding Goggles is designed with a slick black anti-scratch frame, a black adjustable headband and anti-scratch Black IR 5.0 lens to maximize comfort and protection. ANSI Z87.1 and CE EN175 F (Green Series) and CE EN 166 (Black Series) Certifications provide safety for jobs site construction workers, truck drivers, mechanics and others at risk.